Government Jobs offer an opportunity to all candidates to your aspirations into reality. Government Jobs Seekers, who Looking for Govt Jobs 2018-19 in India to get Latest Government Jobs Recruitment / Vacancies completely published in this page. 8th Pass, 10th Pass, 12th Pass, ITI, Diploma, Degree (BA, B.Sc, B.Com, BE), Post Graduate (M.Sc, MA, M.Com, MSW, MBA, MCA, ME, M.Tech etc.) and all other educational qualified Indian Citizens find your Qualification / Eligibility wise Latest Govt Jobs 2018, Upcoming Govt Jobs 2018 like railway job, banking jobs, IBPS, Upsc, SSC etc. Notifications listed in this page. 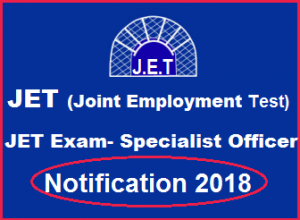 JET Job description: JET Exam 2018 official notification has been released by the JET (Joint Employment Test). Candidates who were waiting for the notification to arrive since long can apply for JET Specialist Officer posts through the official site of JET Exam. JET Specialist Exam is about to conduct in July 2018. Numbers of candidates are looking for accounting jobs, company secretary jobs and jobs for CA (Chartered Accountant) freshers in banks and CS (company secretary) jobs in government sector and in company secretary vacancy in different organisation. Education Qualification Company Secretary (CS) :- Candidate who have already cleared group of company Secretary Exam (CS). Candidate who are preparing to applied/ preparing to applier in final group of company Secretary can also apply. Chartered Accountant (CA) :- Candidate who have already cleared group of Chartered Accountant Exam (CA). Candidate who are preparing to applied / preparing to applier in final group of Chartered Accountant (CA) can also apply. Jet Specialist Officer salary starts from 27,530 to 35,000 with 4 advance increment like the officers are also eligible for Dearness Allowance (DA), House Rent Allowance (HRA), According to X, Y and z Cities. Candidates are first required to go to the JET Exam website jet-exam and click on the Home Page to open the link “vacancies” and then click on the option “CLICK HERE TO APPLY”. Candidates Need to Register Himself First. After Registration Candidates Needs to Fill all the Details which is required in Application Form.